Attendants with a refreshments trolley, Paddington Station, London, 1915. 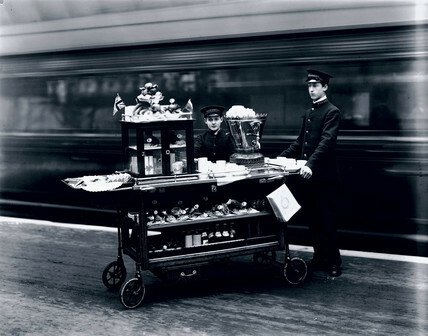 This photograph is one of a sequence taken to illustrate the refreshment services which the Great Western Railway (GWR) provided for its pasengers at London's Paddington Station. The trolley is on the station platform with a moving train behind, and is loaded with drinks, sandwiches, fruit and tea-making equipment.